Diana Dyer, MS, RD: "Bruschetta in a Jar" morphs into a chutney! Cancer Survivors: Take the "package" deal! "Bruschetta in a Jar" morphs into a chutney! Home from traveling late last night, attended a GREAT presentation this morning on Edible Estates: Attack on the Front Lawn by Fritz Haeg (more on that in a future post), tired, without much fresh food in the frig, uninterested in making a trip to the grocery store even though I'm fortunate to have three of them only one mile from my home, too tired to even go out to eat, stalling about whether my husband or I will make supper and what we will actually eat, casually flipping through a new cookbook I purchased today called The White Dog Cafe Cookbook by Judy Wicks and Kevin van Klause when I see a recipe that gives me an inspiration using our own "fast food"! Earlier this fall my husband and I made a recipe called Bruschetta in a Jar when we still needed to find a way to use all the tomatoes we harvested from the 61 plants we had in our community garden. 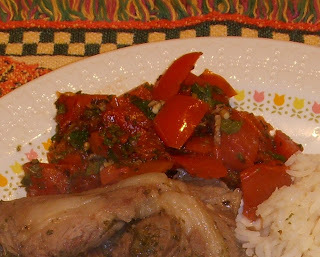 I saw a recipe called Derby Day Leg of Lamb with Tomato-Mint Chutney in the White Dog Cafe Cookbook. I knew we had some lamb still frozen that was left over from our Easter dinner (which we served with incredibly delicious homemade chimichurri sauce). When I looked closely at the recipe for the tomato-mint chutney, I realized that I could take a 8-ounce jar of our "bruschetta in a jar", add 1 Tbsp. chopped fresh mint leaves (while outside this afternoon, I noticed that some of the mint patch right next to our house had not frozen yet) and 1 teaspoon sugar or other sweetener and have a pretty close approximation of the tomato-mint chutney recipe. I quickly put some rice in the rice cooker (one of my favorite "gadgets"), got some kale ready to braise (10 cups of kale, with large stems removed and torn into small to medium size pieces, cooked down to 2 servings), my husband got the lamb out of the freezer and brought up a jar of the bruschetta from the basement, I went outside to cut some mint (38 degrees and sprinkling, which makes it feel like 28 - brrrrr - back to typical November after our gift of several really warm days last week), removed the green leaves, washed the mint leaves and patted them dry, chopped them fine with a chef's knife, then added the chopped mint and sugar to the tomato mixture to let the flavors mingle while the rice cooked. Our meal came together quite easily, and only 45 minutes after putting the rice in the rice cooker, we were enjoying our supper of lamb, basmati rice, braised kale with garlic, balsamic vinegar, and black sesame seeds, along with the tomato-mint chutney. The small amount of chutney that we did not eat was added to some of the left-over rice for a future meal. More "fast food" - Yum, yum, yum!!! The White Dog Cafe Cookbook is dedicated to organic family farmers, whose stewardship of the land and respect for the lives of farm animals preserves a way of life that brings us nourishment and good health. We eat very little meat and also choose to only consume meat when we know the animal has been humanely raised in a manner that promotes sustainable food systems, and thus, we are grateful for the farmer who raised the lamb we ate last Easter and tonight in addition to all the organic farmers who grew the food we ate for our supper tonight. you give food to every living creature. Fill our hearts with joy and delight. in honor of Christ Jesus, our Lord. Through him, may glory, honor, and power be yours forever. I just used "Bruschetta in a Jar" to top meat loaf. Maybe we need to rename it to "Utility Tomatoes"? Isn't is so much fun and satisfying when a delicious meal comes together from leftovers and ingredients that are already in the house? Your dinner sounds so yummy. oh man I wanted to go to that conference and forgot that it was this month already.